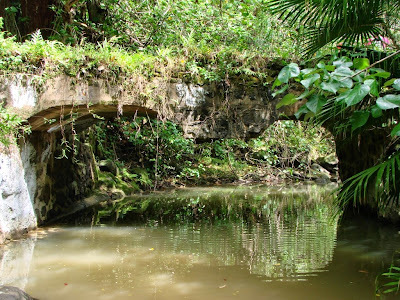 We continue our look at the Kamananui hike with a long at this double arch bridge. Along the trail you will actually find seven bridges but it would be excessive to have seven different bridge photo of the days. The sad thing is these bridge are slowly becoming overrun by nature. Looks almost like its in the Walking Dead or Revolution with nature reclaiming the world. 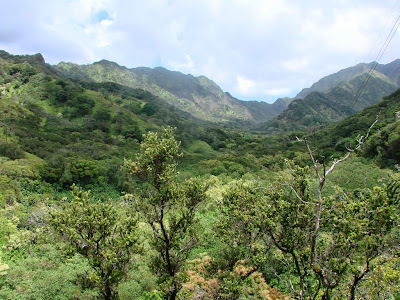 Here is a valley view from along the Kamananui hiking trail. Views like this remind me how lucky I am to live in Hawaii and how great it is to step outside and enjoy nature. My only wish for this photo was for more blue skies and less clouds though the clouds provide a nice respite from the hot sun during a hike. 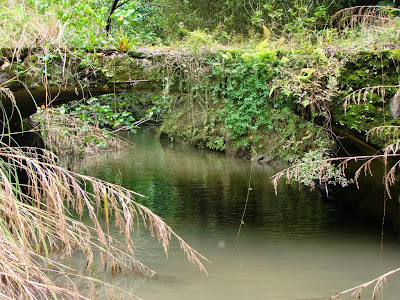 Along the way on the Kamananui hiking trail you will pass seven bridges. Here is one of the less overgrown bridges. Some of them have water under them and others you can choose to walk over or under. I always like interesting things along a hike such as bridges or even fallen trees you can to climb over or even better a section you need to hang on a rope to make it up a slope.